You’re in a small plane. It’s noisy and the air inside is cold and a little damp. You can’t hear anything but you notice that you have a parachute strapped to your back. The door is flung open and suddenly you’re being dragged to your feet. You stand at the open doorway and feel as much as hear the roar of the air surging inside. You can feel the blood pumping around your body and an almost animal-like rush of fear. You feel your knuckles bracing against the side of the door frame. Your nails digging in to the metal. You look around and notice that the plane is so dimly lit that you can barely make out the shapes around you. Suddenly you feel a push at your back and you find yourself being bundled out of the relative safety and into the icy and terrifying wind. Within moments you glance up and see that the plane is already far away above you. You realise you need something to prepare you for this fall and save you from hurtling head first into the hard earth beneath you. That’s when you remember the parachute. Scrabbling under your arms, you find two cords and give each a big tug…. Nothing happens. You try again and again until finally a small flap of fabric opens above you. You realise it isn’t going to be even nearly enough to break your fall. 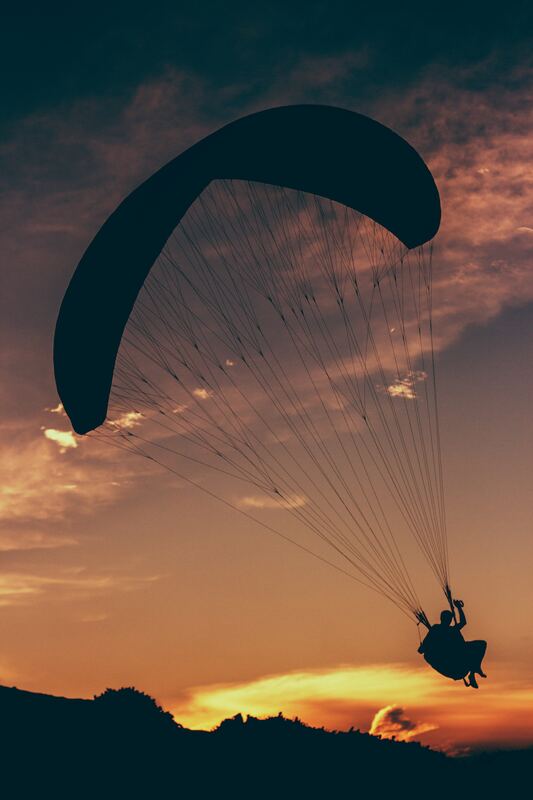 There’s only one hope here – that someone else has their parachute in place and that they will grab hold of you and stop you crashing down. Your parachute was the thing you needed. It wasn’t until you needed it that you realised how vital it was. Until then it just seemed like something to carry. You barely even noticed it and certainly didn’t check if it was up to the job. Meditation, for many people, can really help them to feel more in control, more balanced and more able to cope. Slowing things down so they can land safely on their feet. It isn’t going to stop you falling, but it can mean you enjoy the exhilaration and beauty of the experience. Allowing you to know that whatever happens, however scary the ride is, you will be ok.
Each time we meditate, stitch by stitch we are sewing our own parachute. Just like any other muscle we use, our meditation “muscle” needs to develop if it’s going to be of use when life gets hard. 1. You feel fine so you don’t meditate. Then life gets hard and you don’t have what you need. Your head space feels pretty good, life is going well, so you reckon you’re all good. Until suddenly you’re not. Life happens and then suddenly everything feels out of control. Things seem to be speeding up and going faster and faster. You can’t keep up and your mind is so busy it hurts. You feel anxious and out of control. On the outside maybe you look fine but inside you feel terrible. Inside, your whole body feels tight and pressured. You feel like a coiled spring that is never released. That’s when you discover that you don’t have a parachute that’s strong enough to help you. That the calm was always only at the surface and underneath you’re not equiped with what you need. 2. You meditate diligently while life is treating you well. You feel good. Life feels good. But then the bad times roll in and you stop because there’s no time. It can seem easier to make time and space when the pace of our day to day is bearable. You feel the difference that meditation is making. Maybe the people around you even begin to notice that something feels calmer and lighter about you (that’s actually very common when you begin to meditate regularly). You notice yourself having space to breathe and pause before something triggers a response. It feels good. Then, when the heat gets up, you abandon your practice. Suddenly it feels self indulgent to spend time sitting doing nothing. Especially when there’s so much that needs doing and problems that need thinking about. Maybe you’ll meditate again when things calm down but for now you just don’t have time. The stress returns. You find it hard to cope. You find yourself wanting to just get off the wheel and breathe but you can’t remember the last time you felt able to. Which is like not pulling the parachute cord at all and choosing to freefall (we know how that ends). Like many things, we only truly understand this kind of lesson when we either experience it ourselves or we have someone to guide us to avoid them. I have lived both of those scenarios. Flailing madly through the air before realising my parachute needs more work. And the alternative, where I have abandoned my practice at exactly the time it would serve me most. Luckily, unlike falling from a plane, life gives us the chance to get back up and try things differently. We always have the opportunity to change. Change how we think, change how we feel, and ultimately change how we behave. We can’t always control when the plane we are travelling in will go down. But HOW we go down? That’s in our gift! Laura created Be.Modern Meditation to help people find their way to a more balanced life. Drawing on both ancient wisdom and modern science, this is meditation for the modern world. Laura delivers talks, workshops and coaching to enable people of all backgrounds to harness the power of this life changing practice. Having experienced the impact of meditation to rise up from challenging times in her own life, Laura is passionate about sharing that practice with others.